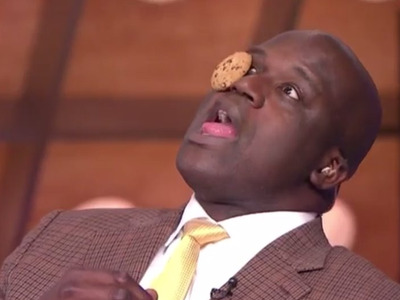 A few days ago, Shaquille O’Neal attempted to complete the Cookie Face Challenge on the set of Inside The NBA. It’s a pretty funny challenge. You start off by placing a cookie on your forehead and then, without using your hands, try moving it into your mouth. It makes for some hilarious facial expressions. Katie Nolan of FOX Sports decided she wanted to show up Shaq, so she tried to complete the challenge herself. I was apprehensive as I watched the video, but it was hard not to laugh. See if you have better luck than Nolan!